A pure concentration of advanced ‘Made in Japan’ racing technology and build quality. The full model transformation from the TF6 to the TF7 has been sharpened further to maintain its technological edge in electric touring car racing with the next TF7.7 evolution. This latest version is not just fitted out with optional parts released after the TF7, but also features prototype parts that made a significant impact at the World Championships and the Japanese Championships such as short Big Bore shocks, center stiffener for improved pitching rigidity, 2-height motor mount, rear suspension holder compatible with A.R.T.S. (Active Rear Toe Control System), front spool cup joint compatible with two types of universal joints and rear diff gear with closing sleeve. With the reliability and durability essential for racing success, the new TF7.7 maintains the optimal left/right roll and mechanical grip of the TF7 and responds precisely to the will of the driver’s commands. ●Proven 2-belt drive 4WD chassis has been completely redesigned to be at the leading edge of competitive racing. ●Symmetrical arrangement of screws used for installation of parts on chassis realizes uniform roll characteristics. Grooves in chassis are also symmetrical. ●Battery mount changed to standard type using fiberglass tape through the mount. ●Large diameter pulley realizes longer life of the drive belt. ●One-piece aluminum motor mount meets the demands of high power output and minimizes gear trouble during racing. ●Front/rear interchangeable bulkhead optimizes chassis balance and realizes efficient spare parts utilization. ●Stabilizer is compatible with the Ultima and Lazer electric off road models. Dedicated to perfect left/right balance of chassis roll, even the mounting screws used on the bulkhead and motor mount are positioned accordingly. Increasing or decreasing the number of mounting screws also finely tunes the chassis roll characteristics. 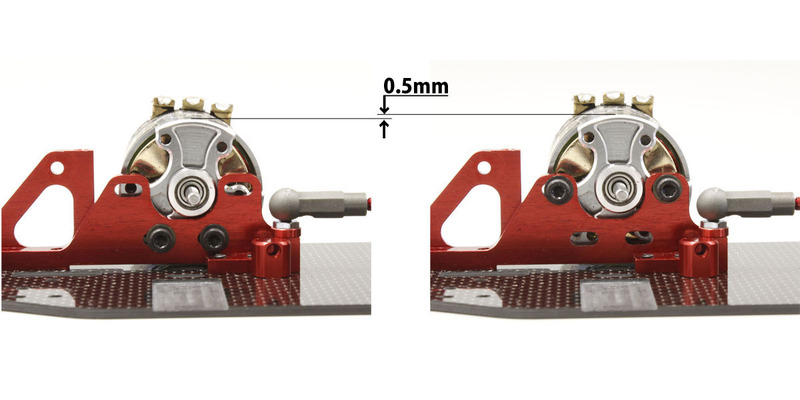 New center stiffener increases rigidity of pitching direction without affecting the chassis roll characteristics to realize increased longitudinal traction and support of high-power drive units. Short-type Big Bore shocks from the TF7 maintain oil volume stability to deliver reliable damping performance and contribute to lower center of gravity and sharper handling. Lightweight spool steel cup joints on front are compatible with both pin-type universal shafts and C-joint universal shafts. To match the demands of high power output, the rear aluminum diff cup joint is equipped with a closing sleeve to prevent contamination of the drive system. Shorter front arms than the TF7 realize quicker steering response in the TF7.7. Reinforced ball ends provide increased rigidity and crash resistance. Redesigned motor mount structure allows motor position to be moved 0.5mm up or down to adjust settings according to surface conditions. Features rear suspension holder (forward side) compatible with A.R.T.S (Active Rear Toe Control System) that allows precision adjustment of toe angle during chassis roll (optional parts required). With addition of center stiffener, the cantilever support structure changes the shape of the hanging steering servo.